What a wonderful venue Urban Forage is for an intimate and personal performance. Jeff is a generous host and a pleasure to work with. I look forward to returning again and again! I loved sharing this lovely night with all of you. Here are a couple of pictures to remind us of the evening of stories, songs, and images from Mozambique. 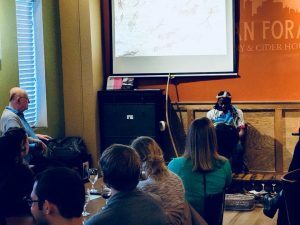 Nyttu Chongo performing for family and friends at Urban Forage Winery & Ciderhouse in Minneapolis on May 12, 2018.